In the woods stalking your next meal, or in the kitchen sizzlin up some grub, this Chef Leo™ Survival pack will make the hard times taste great. Four of the Chef's greatest spices, always put a smile on their faces. This special pack goes great on wild game, beef, poultry and seafood. If all society breaks down you still need your food to taste great. This pack fits the bill. Hurry, this is a limited time offering! 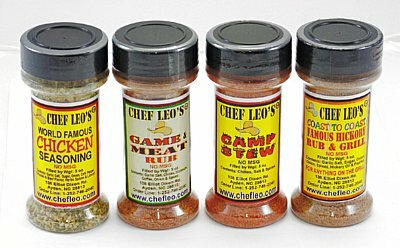 All your friends know A 4 Pack of Chef Leo spices is just the ticket! And with the Hot Grillin 4 package you save 4 dollars on the order! That is right, 4 for $20.00. You can mix and match or get all 4 the same, does not matter, your choice. purchase as many as you want. With this special why not stock up! Ordering note:If you want the multiple packages with the same spices, change the default 1 in the box to the number of deals you want. If you want different mixes of multiple deals, leave the default 1, click on the buy me after choosing your spices, then return and order another. Check out only after you are finished shopping. Go for it! You know a special when you see one! As good as a 4 pack is, the 10 pack is only better! And with the Hot Grillin 10 package you save 20 dollars on the order! That is right, 10 for $40.00. You can mix and match or get all 10 the same, does not matter, your choice. Ordering note:If you want the multiple Hot Grillin' packages with the same spices, change the default 1 in the box to the number of deals you want. If you want different mixes of multiple deals, leave the default 1, click on the buy me after choosing your spices, then return and order another. Check out only after you are finished shopping. Go for it! You know a special when you see one!